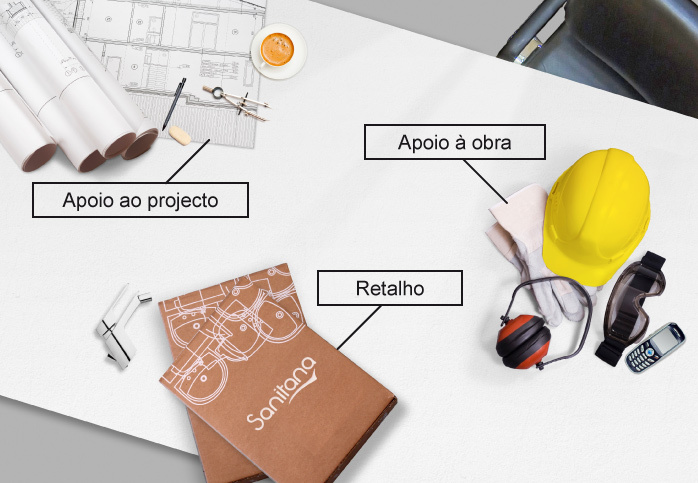 With this conversation with the architect Nuno Brandão Costa, Sanitana launches a set of interviews with the aim of outlining a professional perspective on the state of the art of Architecture in bathrooms. The young architect from Porto feels that, with the renewed focus on architecture, “we have returned to the bathroom of the turn of the century, large, with segmented areas”, in this space which has begun to play a greater role. Bathrooms today are as important as any other part of the home, combining functionality with well-being. How do you view the evolution of architecture in these design spaces? My experience designing houses for many of my private clients has led me to believe that people now give great importance to the bathroom. This probably wasn’t the case earlier. The clients’ commitment is clear, above all to the master or en suite bathroom, as in the case of couples. There is lot of attention given nowadays to the design, that is, to the area of these spaces. No one wants a small bathroom any more. What is most valued: Functionality or aesthetics and well-being? Area is valued the most, as I mentioned earlier. And now, there is a growing trend to segment that space into various areas, such as the toilet and bidet area, the washbasin and looking glass area, and the bathing area - where the choice is often not restricted to a bathtub only, but also a shower base or a larger shower area. However, it is necessary to have a space relatively larger than the traditional four square metres to organise the bathroom in this way. Another important question deals with the finishing, at the level of coatings and the selection of fittings, which receives a fair amount of attention, to put it lightly. Earlier, the bathroom was a marginal space. I feel that this evolution is due to two factors: today, people view this space as not only a functional area for hygiene, but as a place where considerable time is spent in the morning and at night. Therefore, this space must include the necessary comforts. On the other hand, the bathroom has come to play a greater role. Presently, any magazine or newspaper has a space dedicated to wellness, providing trends for these spaces; people are influenced by this information, taking it into account when they make their own decisions. Personally, I feel that all spaces in a house should receive the same attention. The bathroom should not be designed as an extension of the house, but neither should it be of a vastly greater quality than the rest of its parts. There must be a balance. Natural light, design, functional solutions... What elements are now essential in a bathroom? It’s evident that a bathroom with natural light is always more pleasant, but this is not always possible. In these cases, its lack can be compensated by solutions such as skylights or ridge vents. The planning of artificial lighting is as important in the bathroom as natural light. This space is often used at night or early in the morning, when there is no natural light, requiring good lighting. Artificial lighting should not be excessive; in order to avoid causing discomfort, but it should also not be excessively dim. Aside from this, it must be integrated into the bathroom design as a whole, as well as the choice of materials for coating and the colours of the sanitary fittings. Is there a preference for increasingly sophisticated elements, including sanitary fittings? There is a careful selection of coatings and sanitary fittings. I’ve worked in projects in which I designed the washbasins and bathtubs first and then selected the taps. These days, we have a huge supply, ever more sophisticated and often expensive, depending on the budget available for each project. But it is always possible to execute quality projects with more controlled spending. Most brands, such as Sanitana, have accessible product lines. They often start by selecting the washbasin. Also the bathtub; this is the fitting with which people are the most demanding. On several occasions, I’ve had to design these fittings, in marble or to include a platform... With regard to commodes and bidets, the choice is almost always for more simple designs that are not too large, due to reasons of hygiene and so that they do not occupy too much space. My selection criteria are always simplicity and scale. But there is no such thing as a typical client; I’ve never had identical projects. Each client wants a unique home. Architecture for public buildings is more standard, where everything must be functional and practical. With respect to the still difficult question of bathroom cabinets, I always look for solutions where they are integrated into the wall, avoiding locating it under the washbasin, because I feel that most of these solutions affect and take away lightness from the fitting. I try to make cabinets that are much larger, tall and integrated into the wall with a coating that is similar to the surrounding area, in marble or glass, for example. Nowadays, this space is a complex system, integrating all these points. I do not choose by brand, I look for simplicity and the scale of the fitting. I look for fittings that are as simple as possible. Is it true that builders feel that they should have a say in architectural matters, for example in the choice of sanitary fittings? Builders need to comply with requirements, so for me this question does not arise. I feel that this attempt at interference does not happen much with private projects, maybe because the builder also wishes to satisfy his or her client. I also work on public projects, in which case it is necessary to always be informed about the project, or camp out there, as I usually do. The most laborious part of architecture is not planning, but building. Success depends on this, as the planning has to be well designed, well budgeted, containing all the details in the specifications, but if following all this the building work is not monitored, there will be many surprises. It is necessary to establish a foundation of dialogue and trust with the builder and the owner throughout the process. In any case, deliberate attempts to change the selections that are part of the specifications to obtain financial benefits do not seem fair to me at all. In general, those I use the most are marble and ceramic tiles. If possible, I propose marble, because it is an eternal material, a natural stone that does not need maintenance and lasts forever. Very light-coloured stones are generally used in bathrooms, as a result of which the clarity of the material introduces a unique natural colour in a space that is generally small, without much light. When the budget does not allow for marble, I opt for traditional materials, such as 10x10 ceramic tiles, terrazzo tiles or marble mosaic. When possible, I use marble and for a solution that works very well: walls in ceramic tiles with traditional white ceramic china and flooring with terrazzo or marble mosaic. In the end, I revisit the old bathroom. Evidently, there are exceptions. At the moment, I am working on a house where the inner coating of the bathroom is completely in white glass, including the walls. This was on the client’s request, and I feel that it will turn out really well. In terms of base materials, what styles do you prefer (minimalist, purist, bold colours, futurist) and how do you deal with the mixing of trends? What I prefer is complete homogeneity within spaces between materials and the colours used. While making a bathroom in marble, I use the same stone for the walls and the flooring. If I’m working with ceramic tiles, I use the same colour for the different coatings and choose light colours, such as greys and beiges, but avoid using white as it is a very cold colour. Dark and strong colours absorb a lot of light and are tiring. These areas are generally not very large, and cannot tolerate a large variety of textures, which is why I avoid mixtures. These are global trends; I mainly use national brands and find what I’m looking for. At times it’s difficult to choose, because there is so much supply. I feel that Portuguese brands follow the evolution of architecture in these spaces, and are very up to date, so there’s no point in saying that we are lagging. Formerly, bathrooms had a washbasin, a bathtub, commode and bidet. Today, these may do without the bathtub, but with a shower base in its place, allowing for two bathing areas at the same time, or any other bath option. They normally have two washbasins. And their spaces are often segmented into more or less marked compartments, which allows for more than one person to use them at the same time. This is a return to the bathroom of the turn of the century, big, but with more segmented spaces. Although there are also those who prefer large spaces with a bathtub having pride of place in the centre. Do devices used in bathrooms comply with growing environmental concerns through the use of energy and water saving technologies? Presently, no one can do without these versatile solutions. Clients ask for these kinds of devices from the start – flow or temperature reducers and taps with timers, in public buildings; it is accepted that energy is increasingly expensive and everyone wants resources that allow them to save, not only in the bathroom but throughout the home. Nobody ignores these infrastructural issues, which also have the force of law. The concept of sustainability has been popularised, already receiving a response at the manufacturing level. And do manufacturers also respond to ergonomic concerns for those with special needs? I increasingly note that legal reforms that are being introduced have influenced the construction of public buildings. When an apartment block is designed, for example, there is already a significant proportion of construction with accessibility solutions and bathrooms adapted to persons with disabilities. The market is following this evolution and all manufacturers have specific products for these cases, with certified solutions with high technical standards. At the aesthetic level, it is possible that these products remain a little behind, perhaps because the amount of technical requirements comes in the way of development in design. But there still are interesting fittings, perfectly framed within these specific solutions, which are by no means at the margin of the present design of these spaces. All of them. As I said, I give the same attention to the bathroom as I do to the living room or bedroom. The relationship with a project cannot be poor. It is clear that there is enthusiasm in designing something for the first time, on experimenting with new materials. Sanitary brands explore product lines and concepts, offering different options and settings. Clients come with pre-existing notions to their discussions with the designer, as was the case with the project involving the bathroom in glass which I’m working on: this deals with a solution with great potential, because it allows one to design everything, at a higher cost, naturally. This would be highly desirable, but I have not felt it yet. It would be interesting to rebuild the city of Porto, for example, improving its centre, and there must be many houses with high possibilities of rehabilitation - restoration or reconstruction. The world of restoration is very rich, with some presence. But I do not see an increase in that presence with the economic crisis. I have had the opportunity to work on very interesting restoration projects, although most of my work involves new houses and buildings. I must point out that the former is not necessarily cheaper than the latter. What is your vision for the bathroom of the future? I do not foresee great changes in its overall design. There will always be minor changes, but if we take the trouble to observe the original bathroom in the Casa de Serralves, built in the first three decades of the 20th century, we see that it has a lot in similar with present trends. And now there is a return to larger spaces and more demanding architecture, distinguished by the fineness of the materials. It is a somewhat cyclical evolution, arising after a period in which a lot was trivialised, not only in the bathroom, but in all parts of the home. In the 70s and 80s, apartments were highly similar, with a corridor and rooms. Today, with the renewed focus on architecture, people have, happily, begun to realise, that lived spaces must have quality. This evolution has roots in the past, but now with materials and resources that were non-existent then. In the future, what could possibly increase is the demand for quality.